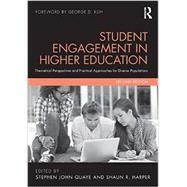 Student Engagement in Higher Educationis an important volume that fills a longstanding void in the higher education and student affairs literature. The editors and authors show how diverse populations of students experience college differently and encounter group-specific barriers to success. Informed by relevant theories, each chapter focuses on a different population for whom research confirms that engagement and connectivity to the college experience are problematic, including: low-income students racial/ethnic minorities students with disabilities LGBT students Religious minority students, and several others. The forward-thinking, practical ideas offered throughout the book are based on the 41 contributors#xE2;#xAC;" more than 540 cumulative years of full-time work experience in various capacities at two-year and four-year institutions of higher education. Current and future faculty, administrators, and student affairs staff will undoubtedly find this book complete with fresh strategies to reverse problematic engagement trends among a wide range of college student populations. The second edition has been fully revised and updated to include new material on Muslim students, online and distance learning environments, and for-profit educational institutions.